90% of people who try to learn guitar quit in the first year. So when Brian Fan wanted to start strumming out lullabies for his baby daughter, he reinvented the instrument itself. Suddenly, a single finger on a button could replace four on different strings, and anyone could learn to play popular songs in a few minutes. Meet the Magic Instruments Rhythm guitar. It might look like a toy video game controller from Guitar Hero, but it can play real music through its built-in speaker. And with the accompanying app, you’ll get instructions for how play tons of popular songs by big name artists from The Beatles to Bob Marley. “The guitar is a 100 year old user interface based on the physics of vibrating strings” Fan tells me. Technology has made everything else easier, so why not the six-string? That premise earned Magic Instruments a spot in the latest Y Combinator accelerator class. The way it works is that when you select a song or key, each chord in the scale is laid out in order on the fret board’s buttons. That let’s you change to a blue scale or any other style without having to figure out new finger placements. Rather than a plastic toggle switch like Guitar Hero, the Rhythm Guitar has fake strings with velocity sensitivity to strum or finger-pick. They give the tactile feel of a real guitar, and can take a hard shredding, but never need to be tuned. 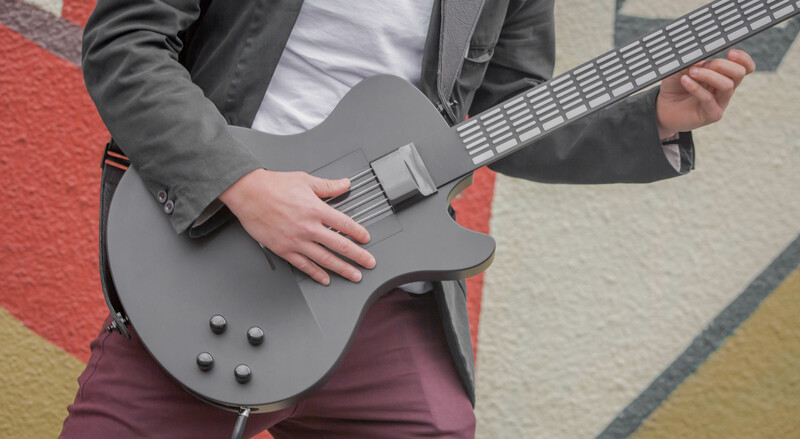 There’s even reverb and tone knobs to customize your sound. It still takes some practice to sight-read the Magic Instruments’ specialized sheet music. At least you won’t lose your place since the guitar’s app detects the notes you play and auto-advances the tablature. Through its standard guitar amp, MIDI, and headphone jack outputs, you can play loud and proud or quietly for yourself. You can also freestyle, playing whatever you want. Rock ban Muse’s lead singer Matt Bellamy is an investor, and he told me he uses it to write songs since it’s so easy to recreate what’s in his head without fumbling to find where to put his fingers. The guitar automatically records your last 30 minutes of playing so if you discover the perfect riff, you won’t forget it. But what’s special is how the device lets beginners refocus on self-expression and playing songs instead of the nitty-gritty finger placements traditional guitars require. The fun part of guitar isn’t doing it the hard way. It’s playing for yourself and others. By simplifying fret board with buttons, you can concentrate on adding some flare to how you strum, and singing along. I’ve played guitar casually for a few years, but learning new songs and new chords takes forever. Yet I was playing a complicated song like “House Of The Rising Sun” almost instantly thanks to Magic Instruments. The company could work on getting some more authentic, sonically pleasing guitar tones into the instrument. And striking more deals for a wider range of songs would court a wider audience. “Real” guitarists will surely make fun of this gadget. Despite all it’s digital tricks, it doesn’t have the flexibility or feel of wielding a traditional guitar. But if you’re just looking for something to create music with at home or play around a campfire, Magic Instruments makes it easy.